You can make meatballs from many different ingredients but here are a few tips to make sure they are perfect every time. Once all the ingredients are combined together, you can check that the seasoning of salt and pepper is right by frying a small amount of the mixture. Pinch off a small bit of mixture and fry it in some oil over a medium heat until it’s cooked through. Taste it and add more salt and pepper to the rest of the raw mixture if needed. Mix through with your hands once more to make sure it’s evenly seasoned. To make the meatballs, first dip your hands in water so the mixture doesn’t stick. Then shape the mixture firmly into balls. Place them in a single layer on a baking tray. Cover the meatballs with clingfilm and put them in the fridge for 15 minutes to set. 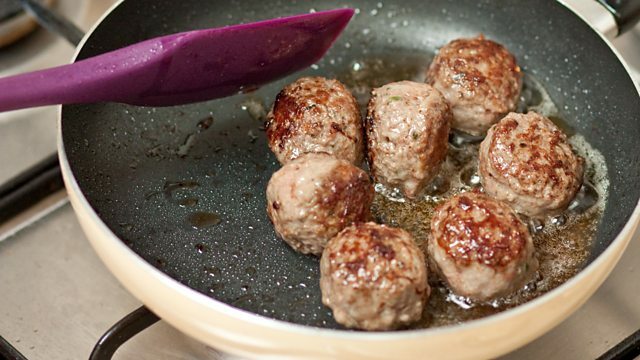 You can cook your meatballs in some oil in a frying pan or in the oven. Continue turning until they are browned all over and cooked through.